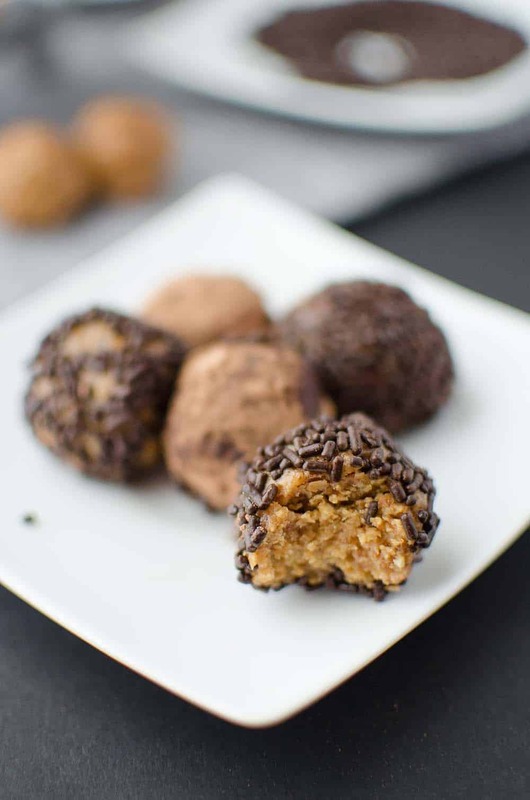 Naturally sweetened chocolate peanut butter truffles! Tastes like peanut butter cookie dough but so much healthier and only 4 ingredients. Vegan & gluten-free. I’m sure you were expecting some kind of “detox” salad for my first recipe post of 2015. Instead, I bring you dessert. 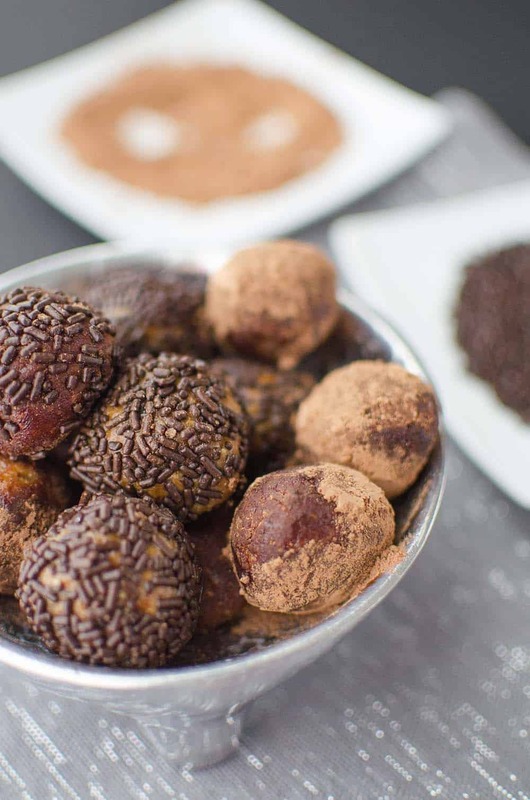 Sure, the truffles are gluten free, vegan, and made with only FOUR ingredients, but they taste decadent enough to be called dessert. Regan Miller Jones (the one, the only) is turning 40! What better way to celebrate than by rounding up a bunch of delicious, healthy drinks & desserts to ring in the new year- and the new decade? Regan, founder of Healthy Aperture, Recipe Redux, Blog Brulee, and a zillion other things, has been an invisible force behind DK. Regan has taught me so much on the power of food photography, and challenges me constantly to improve my food styling, photography and writing. She’s also one hell of a RD and a hilarious, smart southern gal. For your virtual 40th birthday party, I’m bringing a giant bowl filled with chocolate and peanut butter! Yes, these simple, healthy, chocolate covered truffles are for you, RMJ! 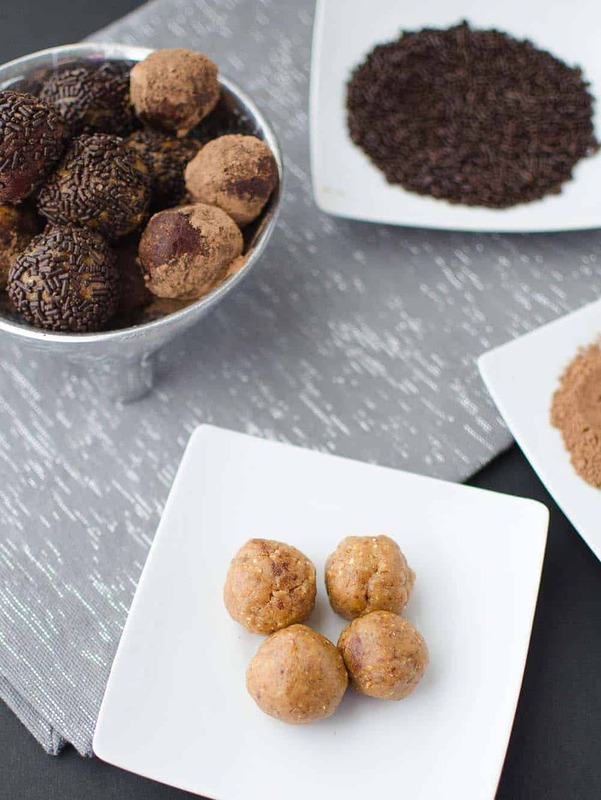 The perfect after all the holiday treats dessert, these truffles taste like peanut butter cookie dough, without any unhealthy ingredients. Because, while the new year tends to be a time that we refocus our attention on better eating habits, there can still be room for dessert. Especially dessert this simple, naturally sweetened and melt-in-your-mouth delicious. To start, we make a quick peanut butter truffle base using dates, peanut butter and pecans. I used pecans because I had a few bags leftover from holiday baking, and I love the rich, buttery flavor. Feel free to substitute peanuts or other nuts instead. This dough tastes just like peanut butter cookie dough! These creamy peanut butter pillows are delicious rolled on their own, but why stop there when we have chocolate? I think I’ve also had my gingerbread truffles on the brain and was really excited to get back into the kitchen to make another batch of truffles. Since I used melted chocolate on those, I wanted to do something a little easier this time around. Because when you want chocolate peanut butter truffles, nobody has time to wait for the chocolate to melt and then harden! Instead, I turned to chocolate powder and my favorite–chocolate sprinkles. Sure, they aren’t naturally sweetened, but I’m OK with a sprinkle of um, sprinkles. Place the medjool dates and pecans into the base of a food processor and pulse until crumbled. Add in the peanut butter and process until mostly creamy. It should stick together when pinched. If you need more texture, add in a few more pecans and pulse together. Place the batter into the fridge for at least 10 minutes, this will make the truffles easier to roll. 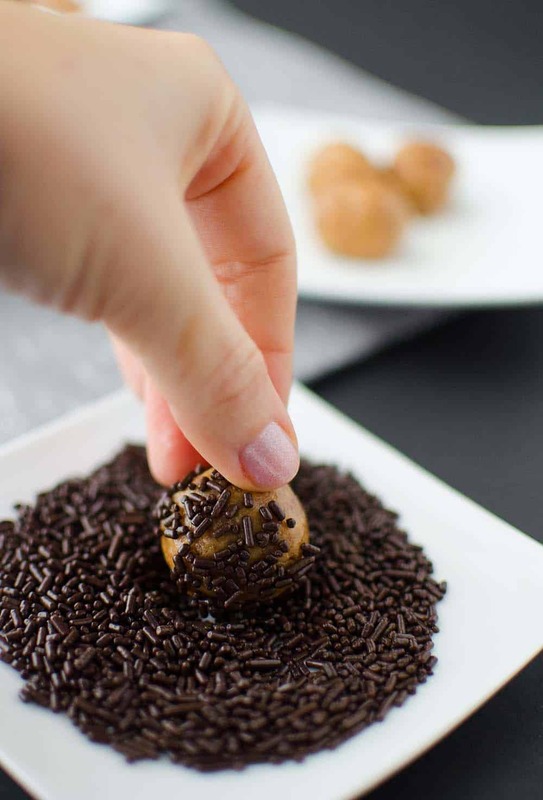 Roll the batter into small, bite size balls. Place the cocoa powder and/or chocolate sprinkles onto plates. Roll the truffles into the powder and/or sprinkles. Enjoy or store in the fridge! 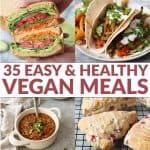 Enjoy all the gluten-free treats and cocktails below! Going on my PB & Chocolate lovers pinterest board! omg omg omg. I’m in love with this combo. I’ve been on a pecan train and date kick lately and I LOVE the thought of pairing it with PB and CHOCOLATE!!! MUST MAKE THIS ASAP. You are welcome mama! Hope you had a birthday as fabulous as you are! I’m 200% okay with 2015 starting off with truffles!! I mean, they’re healthy, so why not?? 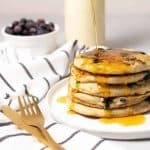 I need to try working with medjool dates sometime. It’s been on my to-try list for forever, so this should be the year to do it! Pinned!